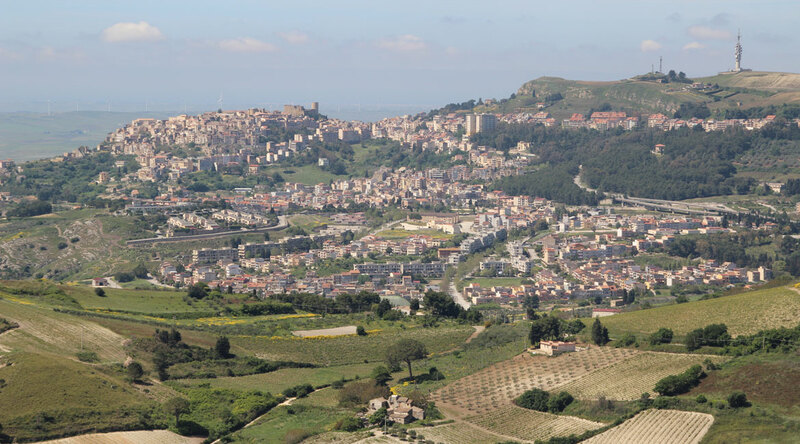 Trapani Mountain range is one of the study zones established by MEMOLA project, and is located in the North western region of Sicily, comprising the municipalities of Valderice, Custonaci, San Vito lo Capo, Buseto Palizzolo, Castellammare del Golfo, Alcamo, Vita, Salemi and Calatafimi-Segesta. In this district, we can distinguish two well differentiated morphological systems. The first one is located in the northern side and is characterized for its magnificent carbonatic massif, surpassing 1000 meters of altitude (1110 meters from Monte Sparagio and 1064 metros from Monte Inici). These calcareous blocks are delimited --in many cases- by fractures, with vertical walls and steep slopes that give origin to narrow, sharp valleys. Carbonatic deposits that belong to the domain of trapanese units are, besides, very permeable to fractures and karstic formations, and, because of this characteristic, they constitute very important water reserves. From the foothills of Monte Inici, by example, springs are found bursting with temperatures surpassing 40ºC; such is the case of the thermal springs of the Gorgo group, exploited in a long-term process that intersects Greek and Roman epochs, as well as Islamic and Normand times. Equally important for the occupation of the territory during historical times, -especially during the Medieval Epoch-, are the numerous springs marking this territory, -among them the springs found in Scopello and Baida. Another remarkable zone is located in the southern area (and therefore, towards the inland) and it is characterized by a landscape of soft reliefs conformed by clayish hills (such as Calatafimi Segesta and Salemi) and wide valleys which give origin to calcareous, isolated reliefs such as Montaña Grande, Monte Baronía or Monte Pispisa. In the territory designated as study zone there are several Natural Protected Areas: Riserva di Monte Cofano and Riserva de Lo Zingaro; additionally we find European Zones of International Importance (Sito di Importanza Internazionale, SIC) such as the coastal area of San Vito Lo Capo, Monte Sparagio, Monte Scorace, Monte Bonifato, Monte de Calatafimi, Monte Inici, standing out due to their high environmental richness and fauna and flora relevant for conservation purposes. This landscape is known by the intense deforestation of the mountain (a common event throughout the whole island), a reduced urbanization process and a progressive destruction as consequence of the traditional agricultural landscape. With all this characteristics, an exhaustive study of the current context provides us with important possibilities of detecting the tracks of settlement organization and analyzing the utilization of resources by the communities historically settled in this zone.